Ranger Pro - Turf and Landscape - Herbicides - Herbicide 2.5 Gallon by NewTechBio, Inc. Contains: Glyphosate, N-(phosphonomethyl)glycine, in the form of its isopropylamine salt 41%. RANGER PRO product is a post-emergence, systemic herbicide with no soil residual activity. It gives broad-spectrum control of many annual weeds, perennial weeds, woody brush and trees. It is formulated as a water-soluble liquid containing surfactant. Ranger Pro Herbicide product moves through the plant from the point of foliage contact to and into the root system. Visible effects on most annual weeds occur within 2 to 4 days, but on most perennial weeds may not occur for 7 days or more. The active ingredient in this product inhibits an enzyme found only in plants and microorganisms that is essential to formation of specific amino acids. 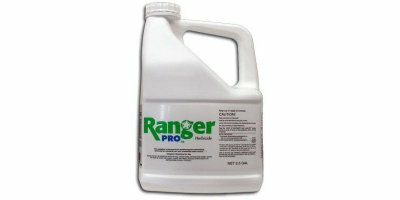 No reviews were found for Ranger Pro - Herbicide 2.5 Gallon. Be the first to review!